The lambs blinked in the spring sunshine, as if this might be their first morning out of doors. On a stone wall dividing the two square fields, a thrush basked. At first we thought it might be a rare exotic species (a red-backed shrike, perhaps?) The camera's screen was tricked by the light and from a distance it was easy to jump to the wrong conclusion; to convince yourself that what you've seen is what you want to see. 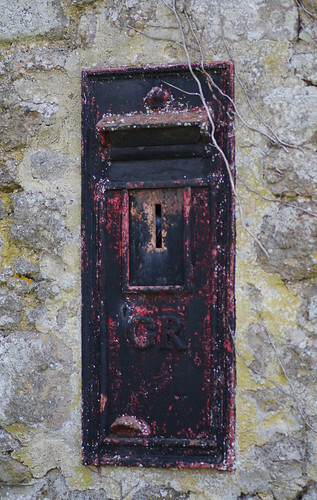 Gratefully, we left the busy Moretonhampstead road behind at Slade Cross and passed a disused, sorry-looking postbox. We proceeded up the hill and took the first footpath to the right. We looked down on the same fields we had observed from the road as the traffic continued to whiz past beyond; pausing to watch the ewes give milk and the lambs nuzzling with their tails waggling. 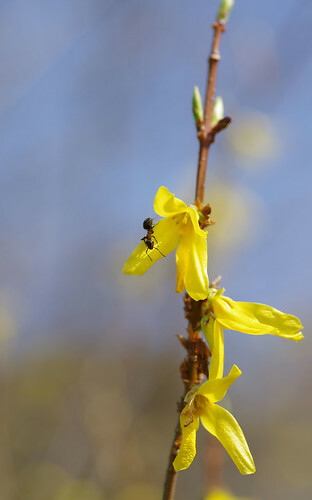 I keep seeing these lovely Forsythia flowers almost everywhere I go at the moment. They are a welcome sign of spring and make a glorious addition to any garden display. The ant in the centre of the frame was the first of many thousands we encountered. As we entered Shaptor Woods, there were bustling armies busy constructing their nests and the ground positively bristled with their activity. We noticed something amiss with our Border Collie Lady's tail. It hung down permanently between her legs, slightly to one side. The poor dog must have sat on the ground and got a nasty nip or spray of formic acid for her trouble. The OS map did not really do the scale of Shaptor Woods justice. It was the sort of place you could spend all day in and not get to the heart of. You could get lost here; tired and without a map to hand. And you could just as easily lose yourself: imagining you have been transported to a different century but your surroundings somehow stay exactly the same. Of course the reality is somewhat different. Every woodland reserve these days is selectively managed to encourage certain species and biodiversity as a whole. By the trickle of a stream, near the green saxifrages, a micro moth flew from the camera's quiet shutter. Jane Redman, our companion for the day, played guide: leaving the path behind to trace the water source. We duly followed to a sort of holding tank that looked Victorian but could have been much older. In it there were literally hundreds of tadpoles. After an extended dry spell and a few more days like the day we were enjoying, how many would survive? The water was already low. What if the tank ran dry? Back on the path, celandines shimmered among the leaf litter and we passed the waxy Scarlet Elfcup fungi, lying on the ground like plasticky imitation ears. They put me in mind of the opening scene of David Lynch's Blue Velvet. But the ants were elsewhere and the ground was undoubtedly pulsing with unseen, crawling millions. If we put our ears to the ground what would we hear - down perilously close to a world we usually step over but never get near? And how long before things crawled inside our bodies, like mere extensions of the ground, waiting to be inhabited and slowly decomposed? Meanwhile, above our heads, another shift of perspective. 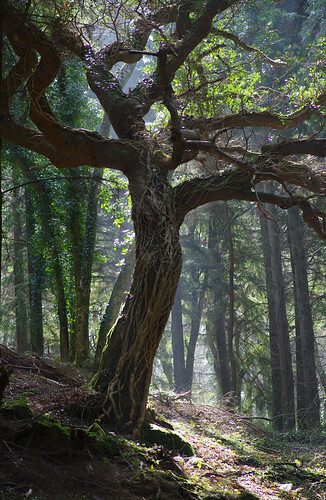 The play of light through this tree gave an arresting illusion of movement. Between the stands of conifers, its branches appeared like writhing, contorted arms. Further into the wood, past fenced-off, disused mine shafts, there were more deciduous trees. Past wilting violets and clumps of pale primroses, we explored another miniature world: equally fascinating, every bit as alien. At last we bid Shaptor Woods behind, promsing to call in again on the way back. We followed a gravelled public bridleway up a hill, towered over by beech trees. Lunchtime beckoned and we headed for Hennock along country lanes until we found a bench. After the break, we continued through Hennock and went up a steep hill for the return loop. 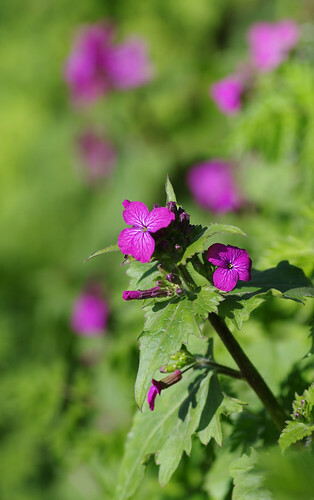 The hedgerows had a good variety of wild flowers. For some reason we usually see Honesty specimens later in the year, when they have their oval-shaped discs like origami shapes. On the way back through Shaptor Woods we made a brief detour. Normally, I am not much of a climber but the way up to Shaptor Rock was happily within my comfort zone. 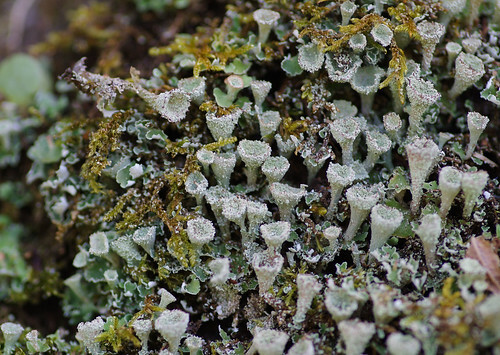 At the top of this granite outcrop, there were patches of garish bright green lichens. Feeling the full force of the afternoon sun, I surveyed the woodland kingdom. Even near to the top, there were still ants. Were colonies establishing their territories here, too? As we headed back through the wood at a leisurely pace, I reflected how the place had held me enthralled. I made a mental note to return at a different season, wondering what other wonders awaited. 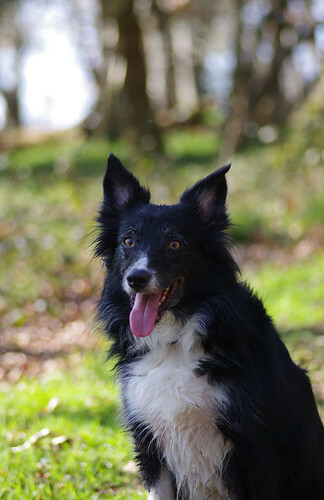 The Lady pauses from her favourite game of stick-hunting to pose for the camera. Her tail is now back to normal and wagging as it should be. We would like to thank Jane for agreeing to join us on our latest adventure. Great photography, where did you find the 'magic tree'? would be interested in getting my own photos of it.